If you’ve what it takes to win the Blue Knuckle Derby, then register now at the Nakusp General Store. This derby takes place on the open waters of Arrow Lakes in beautiful Nakusp, BC. The Lucky Bug Lure Company is a proud supporter of this amazing event! Dawson Creek Sportsman’s Club taking over the Encana Events Centre on April 13 and 14, 2019 as they put on the 42nd Annual Gun and Sportsman Show. This event attracts vendors and people from all over the region. The organizers expect over 200 tables with such goods as firearms, knives, archery, ATV’s and more. This is the largest gun show and sportsman show in the Peace Country. Tickets may be purchased online at www.tigerboxofficeplus.ca, by phone at 1-877-339-8499, and in person at the Tiger Box Office Plus in the Encana Events Centre. Lucky Bug will be joining the Corlane Sporting Goods team in their booth once again for this amazing event! Come and check out our selection of Zombie Maxx’s, Bingo Bugs, Lucky Plugs, Kombo Tools and our newest addition to the Lucky Bug family Fusion EXTREME. 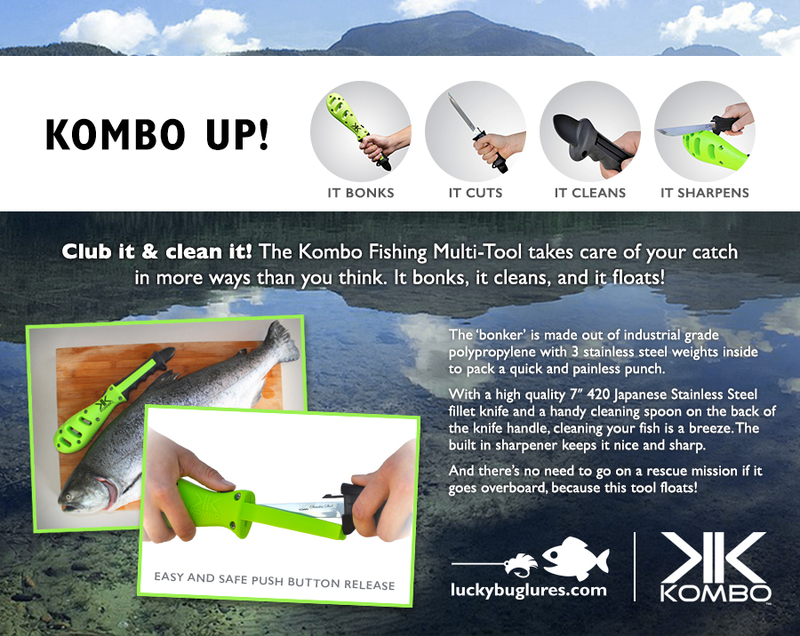 Killing your fish is done in the most humane way with the Kombo Fish Tool. The head of the tool is made of industrial polypropylene and is weighted to pack a quick and painless punch. With a Japanese stainless steel fillet knife, a cleaning spoon attached to the base, and a built in sharpener, the Kombo Fish Tool takes care of the cleaning experience. Safety is in so much more than the physical design of the tool. We focused on building safety into how the Kombo Fish Tool is used. Elements like a release button with two hand extraction keep hands away from the blade. The ‘arms’ that slide down the side of the knife handle assist in keeping it from flying out while bonking. A sharpener keeps the blade razor sharp, which helps avoid slipping and accidental injury. Materials like thermoplastic rubber give excellent grip for swinging and filleting, even in slippery situations. There’s no rescue mission needed with the Kombo Fish Tool! Its innovative design keeps it afloat if it is dropped overboard. Free lure… Just in time for Father’s Day! Don’t worry Dad, this one is on us. We are offering a free size 2 Bingo Bug in our Buckskin pattern, so you and Dad can have a Father’s Day to remember! Just visit our website (luckybuglures.com), add the lure to your cart, enter promo code free lure, and you’re set. 1 free lure per household. Shipping is not included. While quantities last. No substitutions. Share your favourite smoked fish recipe for a chance to win! What could be more delicious than a yummy smoked fish recipe? Well, that’s easy – it would be a smoked fish recipe of a fish caught on new Lucky Bug fishing tackle and smoked in a brand new Bradley Smoker, of course! Bradley Smoker and Lucky Bug Lures are excited to be serving up a contest where you submit your favourite smoked fish recipe. If your recipe is selected as the winner then you will win an amazing Bradley Smoker and a custom set of Lucky Bug Lures. To participate in this contest, just upload your recipe directly to Bradley Smoker by using this link: www.north-america.bradleysmoker.com/recipes during the month of January 2015. As a bonus, if you have fish or cooking photos email them to [email protected] for additional chances to win more Lucky Bug prizes. The lucky grand prize winner will be announced in February 2015. Lucky Bug Stocking Program – Prepare for the upcoming fishing season with our current sale prices! For every Lucky Bug purchase made between December 1st and December 31st, 2014, you will receive an entry into our draw to win a custom set of Lucky Bugs and an amazing Bradley Smoker to smoke your catches in! Online orders will automatically be entered. For in-store purchases you just need to email a copy of the receipt (to [email protected]) that clearly shows that a Lucky Bug product was purchased, in the month of December 2014. Then you will be entered into a draw for this amazing prize pack with an approximate retail value of $750.00. Winner will be announced in January of 2015. *Email your best fishing photos to [email protected] Gear prizes may not be exactly as shown. Limited time only! We’re clearing out some of our factory seconds! These discontinued patterns are still the same high quality you expect from Lucky Bug Lures. Click here to shop online before the sale is over! You Could Win a Lucky Bug Starter Kit! Enter to win our prize draw for a chance at a Lucky Bug Starter Kit (valued at $42.99 CAD!) Starter Kits include 6 Bingo Bug pattern lures. By entering the draw, you agree to sign up for our mailing list. You may unsubscribe at any time. 1) By entering the draw you agree to sign up for our mailing list database. We never sell or rent our lists, but we would like to keep you up-to-date on new information, contests, and online coupon codes you can use to shop online. You may unsubscribe at any time. 2) One entry per individual. Please note we will disqualify duplicate entries from the same email address.